Use the information below for an easier on-campus parking experience. If you have a comment or question about transportation issues on campus, please don’t hesitate to contact us. You can purchase a parking permit from the Brelsford WSU Visitor Center located at 150 NE Spring Street, in downtown Pullman between the hours of 7:00 a.m. to 5:00 p.m. Monday through Friday; Saturdays 9:00 a.m. to 2:00 p.m., or at the Transportation Services building, 7:00 a.m. to 5:00 p.m. Monday through Friday. Persons with disabilities that have special parking needs can click here to find out more about accessing our services. Central Campus Parking is available 24 hours a day in the Smith Center Garage and the Terrell Library Garage. The Smith Center Garage is located just off Stadium Way near the Fine Arts Building in the middle of campus. To access the Terrell Library Garage, turn left from Stadium Way onto Cougar Way, just past Smith Gym, is the booth entrance on the left. These garages are available 24 hours a day on a payment-basis. If the cashier is not on duty, pre-purchase a parking permit from the permit vending machine located at the entrance to the parking garage. Please display this permit on the lower left hand (driver’s side) corner of your windshield. The evening and weekend parking map shows which lots are affected after 5 p.m. on weekdays or all day Saturday and Sunday. It provides a detailed look at where visitors with or without a parking permit can park for free (note the blue areas on the map) or at a discounted flat rate of $3 (note the yellow areas on the map). Note: Times and rules are posted individually at the entrance to each lot on campus. These parking options are subject to change during certain major events, e.g. Commencement, home football games, etc. Be Sure to Read the Signs! Parking is enforced 24 hours a day, every day, so please make sure you park legally. After 5:00 p.m. some Parking Zones do not require permits. Areas where permits are required 24 hours a day include Disabled Parking Spaces, Service Access Spaces, and Fire Zones. Some zones require permits at all times. These zones include but are not limited to Gray, Crimson, and select Green Parking Zones. You can recognize these areas by the signs that say: “Permits Required At All Times” at the entrance to the parking lot. If your vehicle becomes inoperable, call our office to have your name added to the Inoperable Vehicle Log. Note: Any other source is unreliable! Park in one of our garages and only pay for the time you stay. There are metered parking areas in many convenient locations around campus, refer to the Campus Map. The designated disability customer parking for the Transportation Services office is in the Green 4 parking lot across the street on Thatuna Rd. If there is no disability parking available in this location, please park in the 10-minute visitor parking behind the office and call 509-335-7275, a Transportation Services employee will be down to assist you. The following information is designed to help disabled parking patrons park on the WSU Pullman campus. If at any time you have questions regarding disability parking, please contact us. Follow this link for the application and information on how to obtain a Washington State Department of Licensing Disabled Parking Application. Follow this link to the application for an Idaho State Disabled Parking placard. Note: According to the application instructions, you need to mail or fax the application to Boise. However, you can take the application to the Latah County DMV office in Moscow, they will issue a temp permit for up to 30 days while the application is being processed. Here is their contact information: Latah County DMV. PLEASE NOTE: The WSU Access Center DOES NOT issue disability parking permits of any kind. Any valid WSU-issued zone permit displayed with a valid state-issued disability placard or disability license plate. State placards with a current WSU parking permit are valid in disability spaces signed for WSU Disability Permits and any blue, red, yellow, green, orange, gray, and crimson zones, and on-street parking meters. State placards with a current WSU parking permit also allow access to the disability spaces within the restricted area of the pedestrian mall areas on campus. Please drive cautiously on the pedestrian malls. Disability State Placards (with or without a current WSU parking permit) are not valid at any time in Services Areas, No Parking Zones, Fire Zones, or Reserved Spaces. Disability spaces in parking lots during times when WSU permits or payment is not required only need to display a state-issued disability parking permit. Fine Arts parking garage. Take the elevator to the 5th floor for Central Campus. State placards with a current WSU parking permit are required. Smith Center parking garage. Take the elevator to the 3rd floor for Central Campus. State placards with a current WSU parking permit are required. Smith Center surface parking lot. Park in this lot just outside of the Smith Center and take the Smith Center or Fine Arts garage elevators to get to Central Campus. State placards with a current WSU parking permit are required. Library parking garage. Take the elevator to the top floor to access Central Campus. Hourly payment required. Print it, and bring it with you on Game Day. Buy your General Parking permit Online, Print it, and bring it with you on Game Day. Disability parking will be available for game patrons in the Fine Arts Parking Garage. State placards with a current WSU parking permit, disability state placard, or disability license plate is required. Parking attendants can help direct you to specific locations. If you need additional information regarding disability parking for football, call WSU Transportation Services, (509) 335-PARK (7275) or the Brelsford WSU Visitor Center at (509) 335-INFO (4636). General Parking for home football games is available for $20 for the game. 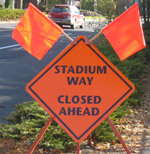 Vehicles must be parked in designated parking areas for home football games. Vehicles parked outside of designated general parking areas may be cited for parking in a No Parking Zone. General parking is available in designated lots in the east of campus. General Parking permits can be purchased online prior to game day or on game day at the entrances to the lots. General parking lots are filled on a first come, first served basis. No spaces can be saved, vehicles are parked in the order they enter the lots. How do I find my parking lot? A Gameday Park and Ride is also available at no cost; follow this link to learn more about the Gameday Park and Ride. Click here to see Game Day Park and Ride Map. For information regarding general parking, call WSU Parking & Transportation Services, (509) 335-PARK (7275). Click here to see the Football General Parking Map. Employee parking on the day of home football games is limited to General Parking areas. Please note that payment is required in ALL General parking areas. A Gameday Park and Ride is also available at no cost; follow this link to more about the Gameday Park and Ride. Note: Wilson Road from Stadium Way to the CUB will be closed at 6 a.m. on game day, to general traffic. The Smith Center Garage, and adjacent Smith Center parking lot will be closed to regular permit and hourly parking from Saturday 6:00 a.m. until shortly after kickoff. Shortly after kickoff, most parking lots are open except the Fine Arts Garage. Normal Saturday parking rules would apply. Be aware that kickoff times vary. Consult your newspaper for the most current kickoff time. Pullman Police to enforce parking codes on college hill during home football games. Safety concerns related to emergency vehicle access on College Hill during home football games have prompted the City of Pullman to announce they will begin parking laws enforcement emphasis patrols in the area during home football games this fall. For more information, follow this link: College Hill Football Parking. Avoid traffic congestion, inclement weather and walking from remote lots by taking the Fall Commencement shuttle. The shuttle provides door to door service from the Lewis Alumni Centre to Beasley and back. Follow this link for more information about the Fall Commencement shuttle service. Follow this link for the Fall Commencement Shuttle Parking and Route Map. Avoid traffic congestion, inclement weather and walking from remote lots by showing up early and getting a spot close to Beasley Coliseum. Please refer to the Spring Commencement parking map for information.